The shooting of Vijay 61 aka Thalapathy 61 will begin on Wednesday. Atlee-directorial has Jyothika, Samantha and Kajal Aggarwal as female leads. 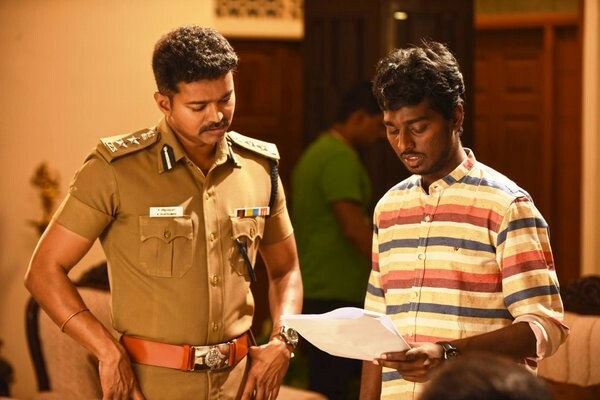 Ilayathalapathy's forthcoming movie with Atlee Kumar, which is presently referred to as Vijay 61 or Thalapathy 61, has been launched on Wednesday, 1 February with a simple event in Chennai. A formal pooja was conducted at the Adityaram Studios in Chennai to mark the beginning of the shooting. Vijay 61 marks the 100th movie of leading production and distribution house Sri Thenandal Films. Hence, the movie is special for the producer, who is making it with a lavish budget. The movie has three heroines- Jyothika, Kajal Aggarwal and Samantha. All the actresses had worked with Vijay before and were hit pairs. If Ilayathalapathy and Jyothika's pair had worked big time in Khushi, his chemistry with Kajal Aggarwal and Samantha had impressed the viewers in films like Thuppakki and Kaththi. Director-turned-actor SJ Surya is playing the villain for the first time opposite Vijay which remains an interesting part of the cast. Veteran Sathyaraj, after Thalaivaa, will be seen alongside Ilayathalapathy again. Comedian Vadivelu has teamed up with Vijay after a gap of six years. They were last seen together in Kaavalan. Sathyan and many others are also part of the cast. The film has AR Rahman's music, GK Vishnu's cinematography and Antony L Ruben's editing. The regular shooting will begin soon and the makers have plans to release the movie in September. Meanwhile, the business of Bairavaa has slowed down at the box office. It has raked in over Rs 62 crore in Tamil Nadu alone.